Central Christian church reached out to All Noise Control to correct the echo problem in the sanctuary of the church. All Noise Control suggested Acoustical wall panels. Acoustical Wall panels are composed of a high density fiberglass core, wrapped in Guilford of Maine fabric which is available in 48 colors. 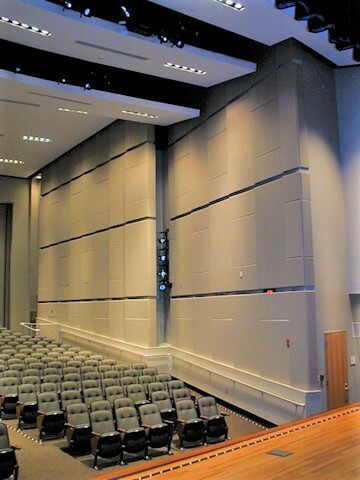 ANC wall panels provide an excellent acoustical solution with NRC ratings from .85 to .95. Their clean and professional look leads them easily into a variety of house of worship, corporate and government settings. The size and quantity of the wall panels are determined for a room by its dimensions. The panels are available is 11 standard sizes as well as custom sizing is available. Once installed, the wall panels cut the sound reverberation in the room by half, from 4 seconds down to 2 seconds! Both the church staff and members were very pleased by the new sound quality in the sanctuary and the enhanced look provided by the ANC-3000 wall panels. With some creative ideas and All Noise Control Wall Panels, the finished look is quite pleasing. You may also visit our acoustic wall panel page or specifically the ANC-3000 used in this partcular church for more information at www.allnoisecontrol.com.